Inspired Closets Baton Rouge builds more than closets; they build custom, luxury, organization experiences. With consultants and showrooms across the United States, Inspired Closets has created some impressive spaces from laundry rooms to home offices and every room in between. Inspired Closets Baton Rouge recently completed a custom master closet. With the ideal space and a satisfied client as the spokesperson, Inspired Closets Baton Rouge saw an opportunity to tell their story. They just needed someone to help craft the story and capture it. With an island, built-in vanity, tons of storage, and reflective surfaces everywhere, the closet was stunning but challenging to capture in video. 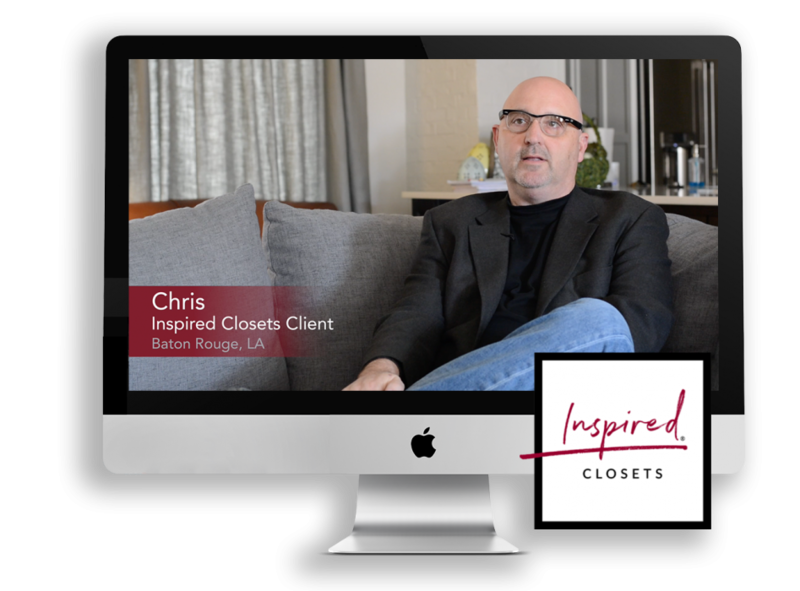 Not only did Inspired Closets Baton Rouge want a client testimonial for local marketing purposes, but they also wanted the video to meet certain requirements for the national brand to use. With those requirements in hand and story to capture, our production team started work. While the Inspired Closets Baton Rouge set-dressing team staged the closet, our videographer and producer began interviewing the homeowner, Chris. After framing the shot and clipping a mic on Chris, we began the interview. He was so genuinely pleased with his new closet that he didn’t need practice or coaching for the testimonial. We asked him a series of questions about the closet functionality and how it impacts his family’s day-to-day life. Then we asked about his experience working with the Inspired Closets team every step of the way, making sure we covered every aspect of the story soon to be told. Next the team moved to the closet. With a slew of lighting, a couple tripods, and a lot of patience, the team shot the closet from every possible angle, making sure to spend extra time on particular features mentioned in the interview. Even though a closet is a static space, our videographer aimed to breathe life into the already visually stunning amenities. The glossy, black surfaces and the mirrors facing each other made lighting a challenge, but the team carefully placed lights to brighten the darker nooks without creating blown-out spots. With a keen eye for engaging composition and a mind for storytelling, our videographer captured the beautiful design and efficient organization Inspired Closets Baton Rouge created for Chris and his wife. The resulting footage was a series of scenes that glide the viewer through the space as if they were choosing their own outfit for the day. With Chris’s testimony as the guiding narration, our team crafted a visual story that not only shows the expanse of the closet and highlights the details that make the closet unique but also reveals the stress-free and luxurious experience Inspired Closets provides. After only a couple edits from the Inspired Closets local and national headquarters, we added a quiet but fitting soundtrack and the video was ready for national promotion.